Well, I'm back! Did you miss me? I've been pretty busy the past few weeks, and Susanna Leonard Hill's Perfect Picture Book Friday has been put on the back burner at my blog. But now it's back (and so am I :D) - with this delightful book that charmed my socks off. First Sentence:There once was a man named Norman Qwerty...whose ideas were far from ordinary. 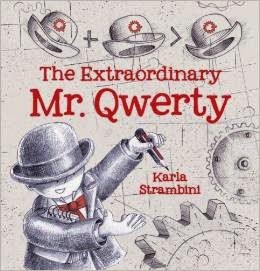 Synopsis: Mr. Qwerty worries that his ideas might seem strange, so he keeps them under his hat. But extraordinary ideas refuse to stay hidden for long. Norman Qwerty is a man of many ideas, and none of them are the least bit ordinary. He’s quite certain that no one else thinks the way he does, and this makes him keep to himself. But when his ideas get too big to hold in, he builds the most extraordinary thing! Soon the beloved Mr. Qwerty is never alone (unless he wants to be), and the world will never be the same. Resources: This book makes use of a couple idioms - thinking cap, keep under your hat. Talk about idioms with the kids - check out this site for a few - and some others here. You can also talk about Rube Goldberg machines (several of which are illustrated in this book)- and perhaps try to make something like one. Hope you'll give this book a look - and check out the OTHER perfect picture books for today at Susanna's blog - and Susanna's ever-growing list of wonderful picture books. Oh, I really like your pick. I like the stories about innovators and where their ideas come from. Important for kids to know. Great focus on keeping your ideas under your hat -- better to share. Such a great pick today. Well, you sold me! Sounds like an awesome tale!! Thanks! Really is - hope you (and your mama) enjoy it! Wow! The cover illustration makes me want to see more! And I think my son would love to read this one, too! Thanks for featuring! The illustrations are TOTALLY engaging, Jilanne - I'm sure your son WOULD love it! Thanks for stopping by! This looks fantastic! I love how the cover is black-and-white with highlights of red! I love reading picture books that stay with me long after I've read them. Thank you for the recommendation! This is such a fun book - because of the silly engineering.... and wild imagination. Exactly, Sue. :) Thanks for stopping by! Intriguing first sentence and cover! I'm going to look for this! Hope you can find it, Andrea. It's most definitely a gem. Thanks for stopping by! I'm sure you'll love it, Susanna! You're welcome - and thanks for the encouragement! I haven't heard of this one. I hope my library has this one. When the snow melts a little, I should be able to make a library run. If I waited for the snow to melt, I'd probably only go to the library four or five months of the year LOL. I hope you CAN pick it up - and that you enjoy it. Thanks for stopping by, Stacy!